Darren Stevens hopes Kent's young side can hold their nerve as they bid to reach the final of the One-Day Cup. The Canterbury side travel to Edgbaston to face Warwickshire in their semi-final tie on Thursday. 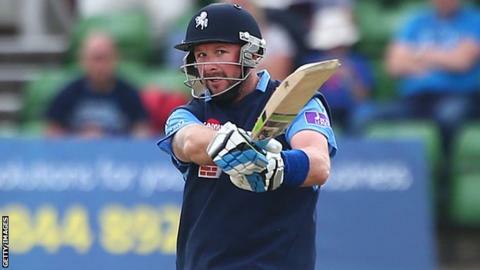 "We have fought all the way and that's what I've been really impressed with, especially with the youngsters," the all-rounder told BBC Radio Kent. "They have found their feet and we have played patches of really good cricket this year." The 38-year-old added: "Coming up against the Warwickshire lads, they have got nothing to worry about. "We don't talk too much about the opposite side. We might speak a little bit about areas of scoring but we concentrate more on what we are doing. "We are not scared of them. They are playing good cricket but we are playing okay cricket, competing and winning. "If we have a good day out then who is saying we can't win the game comfortably?" "I'd say it is the biggest game of the year. Edgbaston is my favourite ground in the country. I'm personally very excited to get up there." Stevens has been impressed with the contribution of wicketkeeper-batsman Sam Billings and batsmen Fabian Cowdrey and Daniel Bell-Drummond in the 50-over competition this year. Billings in the third-highest run-scorer in the One-Day cup this year, with his 418 runs coming at an average of 104.5, while Cowdrey has 295 runs at 42.14. "Sam has played with no fear," Stevens said. "He has been 100 miles an hour. I love the way he plays and it reminds me a lot of myself. "The other two lads have been a bit more reserved and found a way of scoring without taking too many big risks. "Hopefully this week coming up one of them gets a big score. "That is what we have been asking for; one of the top four getting a hundred and being there in the last two or three overs. "We have not quite had that yet although we are in a semi-final. We are doing something right." Stevens, who won the Twenty20 Cup with Kent in 2007, is relishing the trip to Birmingham to face Warwickshire. "I'd say it is the biggest game of the year," he said. "Edgbaston is a great ground with a new stand and is my favourite ground in the country. I'm personally very excited to get up there."